If I can make a palmier as beautiful, flakey, perfectly formed, and buttery crisp as the ones found in Paris' Ladurée pastry shop, I’ll be a happy guy. It’s a tall order, as they make some of the prettiest pastries around, but I went into the first week of the puff pastry unit with that end goal in mind. Puff pastry has always been something that scares me a wee bit—if everything from the room to the rolling surface and particularly the ingredients themselves aren’t kept cold, the end result could produce, say, cheese twists that resemble misshapen churros—something I know firsthand from fumbles I’ve had at home. We started the week by making quick, inverse, and classic puff pastry doughs, which all use similar techniques of rolling and folding dough that’s chock-full of butter multiple times to produce a baked product that has hundreds of crisp layers stacked one on top of the other. 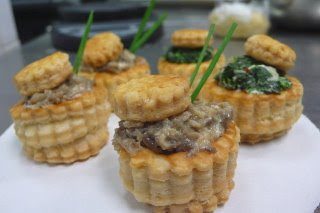 From these doughs, we made apple tartlets, cheese straws, bar tarts, mille-feuille and pretty little savory treats called vol-au-vents (pictured) that I can’t wait to make for the next gathering at my apartment.